In order for a Canadian Death Certificate to be accepted as valid in a foreign country it must be authenticated and legalized. The validation process of Death Certificate Authentication Legalization may also be called a Death Certificate Apostille or Attestation in other counties but is recognized as the equivalent. Authenticating a Death Certificate with us is easy. Let’s get started with why you may need to do it. Some of the reasons why you may have been asked to get Death Certificate Authentication Legalization or a Death Certificate Apostille are: for a registration of a death abroad, to close a bank account, or address estate matters. Whatever the reason, we can help. We have been helping people authenticate and legalize Death Certificates for 20+ years for countries such as the USA and Russia where it is called Apostille, Colombia where it is known as Legalization, and in the UAE where it is known as Attestation of Certificates or in China Death Certificate Authentication. Do you have the correct Death Certificate for Authentication? It is important to make sure that you have the correct style of Death Certificate for the purpose and country in which you will be using it. It also must be one that Global Affairs Canada Authentication Services Section will be able to authenticate and that the embassy will be able to legalize. When using our legalization services, we ensure your document is correct to prevent delays. Both steps of authentication and legalization must be completed to be accepted as a Death Certificate Apostille in a country which has signed the Hague Convention. How does Death Certificate Authentication Legalization work? Good question, let’s start with the first step of Authentication that takes place at Global Affairs Canada here in Ottawa. The correct type for Death Certificate Authentication at Global Affairs Canada is the one issued by a provincial government vital statistics department. It can be the certificate sized or the long form certified copy of the registration of death. Both come as certified true originals by the province and do not need to be signed by a Notary. It’s important to know that a Funeral Directors Certificate issued by the funeral home cannot be authenticated by Global Affairs Canada even if signed by a notary. See our Global Affairs Canada Authentication Requirements for more information. If you do not have the correct style you can easily order it from the provincial government vital statistics departments we have listed on our Document Resources page. When ordering, you will likely have an option to have the certificate delivered to our office. Many of our clients choose this option as it allows for quicker Death Certificate Authentication and Legalization. This, added with our Death Certificate Authentication services, can save you 20 business days off of the current processing time for Death Certificate Authentication at Global Affairs Canada. The second step of Legalization takes place at the embassy consulate of the country where you are going to be using it. Most embassy consulates are located here in Ottawa and charge a fee to provide document legalization services. In addition, some have other requirements or processing times that change often. But not to worry, our document legalization services will take care of all of that making sure it gets done correctly and meets your timeline. 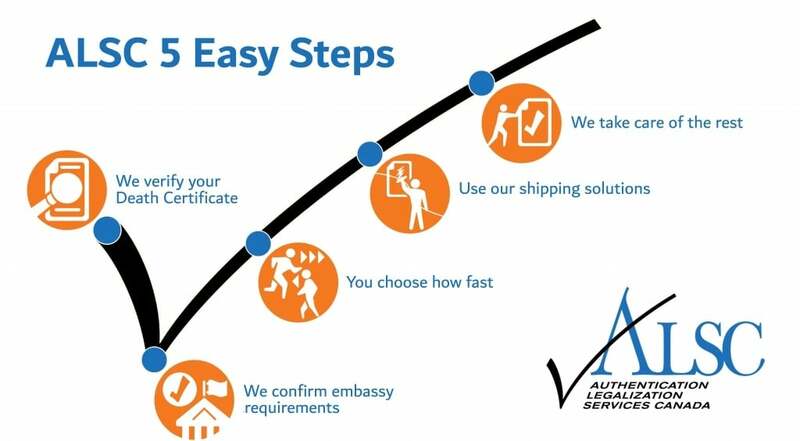 After the Death Certificate has been authenticated and legalized, we can return it back to you or anywhere in the world it needs to go using one of our document shipping made easy solutions or using your preferred delivery method. If you have been asked to get a Death Certificate Authenticated and Legalized or Apostilled, you may have other documents like a Birth Certificate, Marriage Certificate, Will, or Power of Attorney that also require authentication and legalization. We can help you authenticate and legalize these and more documents when you use our Quick & Easy Verification on our home page. Now that we have helped you confirm that you have the correct type of Death Certificate, you are ready to begin the Death Certificate Authentication and Legalization process, also known as Death Certificate Apostille Certification. We understand it can be a difficult process; our services will make it easy for you!